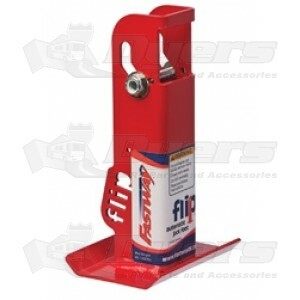 Fastway Flip Automatic Jack Foot - 2-1/4"
No more hauling around wood blocks to stabilize or level your 2-1/4" tongue jack. Tired of hauling around and stacking up old 2x4s, just so you can get a little more height from your jack? The new Fastway® Flip™ takes care of those hassles for good. The Flip jack foot attaches permanently to the bottom of your jack's inner tube. As you extend your jack, the Flip jack foot extends down, and locks into place. When you raise your jack, the Flip jack foot automatically tucks up under the frame and out of the way! Almost any 2-1/4" jack inner tube; round or square, manual or electric. this was easy to install it took about hour encluding rounding up tools. I drive some where to camp hate haven to kneel on the ground. this save you from doing that. love it.